Across most key Indian office markets, secondary business districts (SBDs) are emerging as the new favourites of occupiers due to the availability of larger floor plates and latest amenities that suit most occupiers’ requirements besides offering options in superior grade-A assets to the discerning occupier. In the more traditional markets such as Mumbai and Delhi, the SBDs have been seeing more occupiers move in, at the cost of their CBDs. Central business districts (CBDs) are largely losing out to the SBDs due to lack of project- and precinct-level infrastructure and hardly any new grade-A supply. A look at the supply that is supposed to come in from 2016 to 2020 in these CBDs shows negligible supply in Mumbai, Delhi-NCR and Chennai; and very less supply in Hyderabad and Kolkata. Pune’s supply pipeline shows slightly lesser than 0.5 mn sft new office stock. Only Bengaluru expects a supply of ~2 mn sft in its CBD. The ‘most dynamic’ city globally also stands out when it comes to its CBD’s relevance thanks to its grade-A stock. Even today, Bengaluru’s CBD sees many transactions and continues to remain attractive for occupiers. 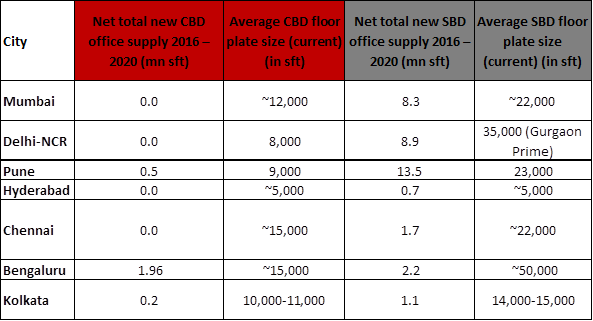 Occupiers in the city prefer to take up large floor plates in the CBD and larger ones in the SBD. 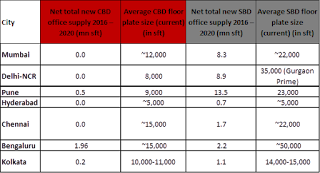 This is revealed after looking at the average floor plate sizes of the city’s CBD (where the average floor plate size is ~15,000 sft) and SBD (where the average floor plate size is ~22,000 sft). A comparison of the difference between average floor plate sizes across CBDs and SBDs of key Indian cities reveals that Bengaluru has the starkest difference of all. The difference between its two averages is 35,000 sft. The difference in Delhi-NCR’s case is 17,000 sft – less than half of Bengaluru’s but still significant enough – and demonstrates the availability of some very large floor plate options in its SBD. Pune follows with a differential of 14,000 sft. Mumbai comes next at 10,000 sft and is followed by Chennai at 7,000 sft and Kolkata at 4,000 sft. Hyderabad too stands out as there is no variance in the average floor plate sizes in both its CBD and SBD. As office properties in both these districts have been made on smaller land parcels, there is a lesser number of grade-A assets too. This keeps the corporate occupiers away. Also, as both are located in older areas of the city with infrastructure limitations, neither the CBD nor the SBD are the core office districts. Corporates prefer HITEC City and Gachibowli areas. The CBD and SBD here are mostly chosen by architecture and law firms, similar to what is seen in Mumbai’s CBD. What bodes well for the future of these SBDs is that their grade-A universe is set to expand what with real estate investment trusts (REITs) about to launch in the country. Developers and funds that own many assets across India are expected to refurbish/ upgrade certain buildings in their portfolio into grade-A or superior grade-A assets. 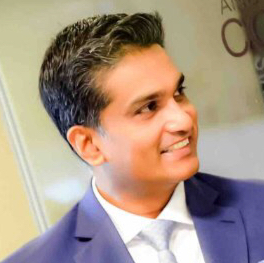 With these developments and most periphery business districts still having connectivity issues, most of these SBDs will stand to benefit in the years to come.